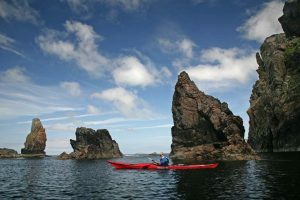 Sea Kayak Journeys - Active Outdoors Pursuits Ltd.
Sea kayak journeys are one of the best ways to explore the dramatic coastlines in the British Isles. 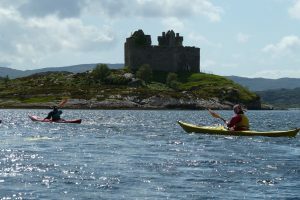 The journeys are spectacular and sea kayaking is a very rewarding way to discover hidden gems that Scotland has to offer. All the islands you journey to, by and around have their own unique history and geographical features. The North coast in particular is home to an abundance of marine and wildlife. It is an incredible journey to remote areas of Scotland and experiencing the beauty that our country has. Explore our world class coastline and discover parts of Scotland steeped in history and tradition. Camp under the stars on whit sand beaches, paddle along side seals and underneath cliffs home to nesting birds. 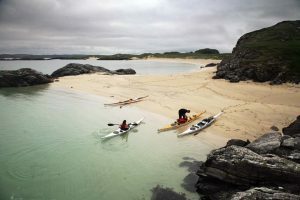 Our sea kayak journeys explore the North and West coastline of Scotland from Loch Shiel up to the far North. Take a look at our trips below and book your adventure today.